Gaily clad in brilliant, neon-hued colors, Day Geckos (Phelsuma spp.) 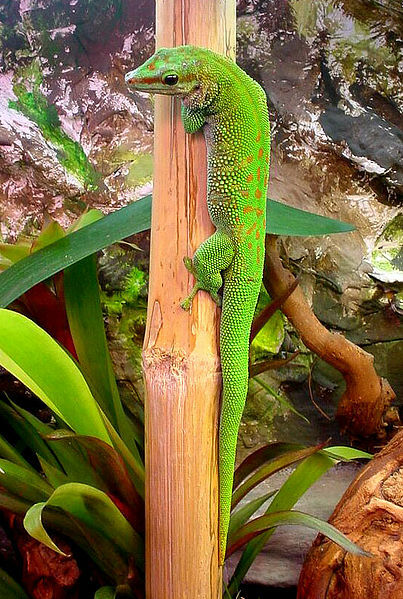 are among the most desirable of all lizard pets, so here is a short article about Day Gecko care. Many are hardy, long-lived, and relatively simple to breed…but only if they are housed in a properly-designed habitat. Active and alert, these cautious animals fare poorly in bare enclosures, but are ideally suited for life in naturalistic, planted terrariums. The security provided by dense plantings and well-placed branches will put Day Geckos at ease and allow you to view a wide range of fascinating behaviors. Day Geckos are highly arboreal and must have climbing opportunities. “High-style” aquariums make fine homes. A pair or trio of Spotted, Yellow-Throated or other small species can be kept in a 15-20 gallon aquarium. 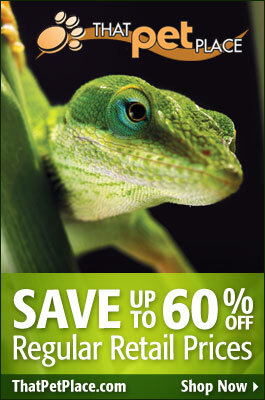 A 30-55 gallon tank will accommodate the same number of Standing’s, Madagascar or Giant Day Geckos. Always opt for the largest terrarium possible. Day Geckos need spacious enclosures that mimic their natural habitat. Live plants such as Pothos and Philodendron will provide visual barriers between tank-mates and a sense of security. Rolled cork bark and hollow bamboo sections make ideal hideaways and perching sites, and should be arranged both horizontally and vertically.